My husband is cranky, which means that I am cranky (I’m not cranky at him, it’s more like I’m cranky with him, or I guess more accurately I am cranky near him). Today was a perfectly fine day for me with the all the normal ups and downs. Nothing out of the usual here (except that now our daughter can get up onto the couch all by herself which means that when I got back into the living room after flipping a load of laundry from the washer to the drier she was sitting on the couch holding the Xbox controller and watching TV like a mini version of her father and it was… surprising). He came home in a bad mood and it kind of changed the mood of the entire house. Whatever, I totally understand. He works for a soulless corporation that is slowly sucking out his will to live. Hey, trust me, I get it. Remember me, of the career in the mortgage industry? I get the soul-sucking-deadening-inside. And we are a team and I agreed to love him for better and for worse and all that jazz. So, in the spirit of being on the same team, I am cranky with him (nay, near him). Go Team Cranky! Right now I think we are both trying to go to our happy places. His is on the couch playing video games and watching what sounds a lot like professional wrestling (did I mention my husband is secretly a thirteen year old boy) and mine is typing away on the computer with some cookies, some pretzels, and a beer (did I mention that I’m secretly Cathy, from the comic strip Cathy). Our couch climbing daughter is blissfully asleep, having worn herself out hiking up Mt. Sofa for most of the evening. I feel like the tension that was hovering over us during dinner is rising up and floating away. 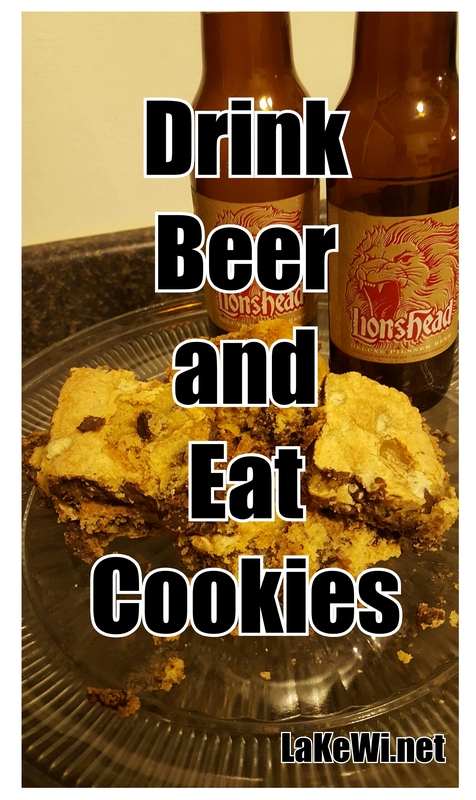 TV, beer, and cookies for the win. Now, I’m going to reiterate just in case I wasn’t clear, I’m not upset with my husband but upset alongside of him. I love him and care about how he feels. His woes are my woes. When he is feeling downtrodden and put upon then so do I (sometimes… when he’s upset because he feels like I’m nagging him about leaving his socks next to the hamper instead of two inches over and inside the hamper, well that’s his burden to bear… put your damn socks in the hamper and I won’t have to nag you about it, duh). We are a team, cranky or otherwise, and I have his back. Just like if he came home happy because he was just offered his dream job of… I don’t know, reading video game comic books while wearing a wrestling mask and eating chicken wings… well I would be happy too. As long as that job came with some solid insurance that included dental and a vision plan, obviously. Until that time I’m going to have to find another way to keep the morale in this house elevated. And, although a steady diet of cookies, pretzels, and beer consumed by the sweet lullaby of wrestling and… maybe Fallout Four? I’m not entirely sure what he’s playing, sounds good in theory, I don’t think it would be that great in practice. First of all, I would have diabetes within a month, for sure. I’m certain my husband would get some sort of video game related thumb injury. Plus, think of the child. She’ll grown into some wild half Gremlin half Mowgli creature that thinks nothing of diving off the couch and onto the coffee table with a stuffed animal in a head lock. That is not a good look for this family. Although, if some other family wants to try out this parenting method and report back to me, I would be very interested to hear the outcome. I’m also going to have to find a better way to communicate to my husband that I’m on his team, no matter what. And not just because we are stuck together for the next 16 and a half years. I may not have done such a good job of it tonight and I feel like maybe we both retired to our separate corners to regroup. I think that’s more of a boxing reference than a wrestling one, but I don’t know enough about wrestling to be certain. And since everything I know about boxing comes from the Rocky franchise… I don’t know, maybe something else entirely happens in those corners. We’ll never know. Or at least I won’t, because I’m too lazy to look it up and the idea of boxers hanging out in their own separate corners collecting their thoughts and maybe wondering if they need to diversify their retirement portfolios kind of appeals to me. In the future I think I’ll do a better job of telling him all of this when we are in the moment. Not like tonight where we ate a mostly silent dinner together. I’ll remind him that we’re on Team Cranky together. Maybe I’ll make shirts or a handy little flag to waive at him when he is feeling down. Next time, I’ll a better job. As for now, I think the only answer is to finish typing this up, post it on my blog, and go to sleep. He’ll read it tomorrow and know that I care. I’m going to make him read it tonight.